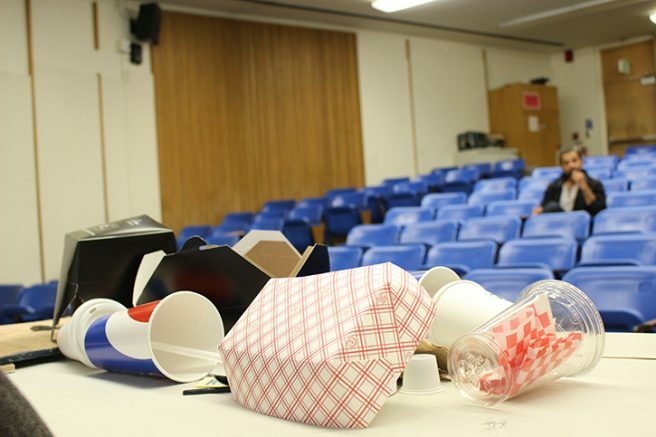 On Thursday April 20 in room 160 at Raef Hall, Don Reed addressed the current recycling fallacies present at American River College. “It’s not because I’m a tree hugger, which I am, it’s the law,” Reed said. Showing the measures ARC has gone to, Reed pulled up Google Maps and showcased the fact that all trash and recycle cans on campus are now geo-tagged. Sarah Mattson, an ARC art professor, has joined the cause by recycling garbage panels as art canvases to put on recycle cans throughout the ARC campus. Student Senate has also taken part in the endeavor within recent years by having water bottle refill stations installed at some water fountains. The new installation has saved over 200,000 water bottles and is still going strong on campus to this day since its installation in 2015. Referring to the new trash and recycle cans that have recently been installed in the ARC cafeteria, Reed explained the purpose behind the new and improved bins. “We build the infrastructure and then we teach people how to divide their trash,” Reed said. As of now, trash cans outnumber recycle cans on campus 200-14. AB 341, California’s latest waste management legislation, states that its goal is to have California recycling at least 75 percent of its waste by the year 2020. This law requires that public entities, large households and other big establishments that produce four or more cubic yards of waste per week to indefinitely adopt recycling practices. Recent studies conducted by Reed and his team found that only 30 percent of ARC waste was correctly placed in the waste bin it belonged in throughout 2016. Referring back to the new garbage system within the cafeteria, Reed expressed again what the mission is. “The hope is that the infrastructure shows people that this goes in here and that that goes in there,” Reed said. Be the first to comment on "ARC Must Recycle"